¿Hablas español? Nowadays, it is often necessary to express yourself in a foreign language. Being able to prove your language skills is just as important. We would like to help you to get your DELE certificate and clarify any queries you may have. So we gathered all the necessary information about the DELE exam 2019: its levels, available dates and prices, past exam papers, preparation courses and much more. How to Register for the DELE Exam? Where to Take the DELE Exam? When to Take the DELE Exam in 2019? How Much Does the DELE Exam Cost? Which DELE Exam Should I Take? How to Prepare for DELE Exam? What Can You Expect On and After the Exam Day? The Diplomas de Español como Lengua Extranjera (DELE) are official Spanish language proficiency diplomas, organized by the Instituto Cervantes and granted by the Spanish Ministry of Education, Culture and Sport. First of all, what does DELE mean in Spanish and in English? DELE stands for Diplomas de Español como Lengua Extranjera (Diplomas of Spanish as Foreign Language). It’s a worldwide recognized title of Spanish proficiency. Since 2015 Spanish natives and learners alike can take part in it. Overall, it consists of four parts – reading, writing, listening and speaking. And you can take it in six different Spanish proficiency levels. That’s where it differs from other certificates. Take for example the SIELE. It’s another Spanish diploma that you can obtain at the FU International Academy. It’s assessed online with questions that gradually increase in difficulty. So rather than you choosing your overall level before, you’ll find it out in your results for each test area. Also, you don’t need to complete all sections of the test and can decide to simply take parts of it. Do you only want to prove your listening and talking skills? That’s possible with the SIELE. However, in the end, the certificate is only valid for 2 years. When taking the DELE exam, you need to decide on a specific level and take all four test areas together. In return, you get a diploma that’s valid for a lifetime. But why should you go through all that trouble anyway? Let us tell you. The Instituto Cervantes (Cervantes Institute) is a worldwide non-profit organization, named after famous Spanish writer Miguel de Cervantes and set up in 1991 by the Spanish government to promote the teaching and study of the Spanish language and culture. Whenever you read about the DELE exam, you stumble across the Instituto Cervantes. What is it though? Well, have you ever heard about Don Quixote? He’s the protagonist in one of the most famous Spanish novels written by Miguel de Cervantes. The story recounts the adventures of “The Ingenious Nobleman Mister Don Quixote of La Mancha” on his journey to bring justice to the world. 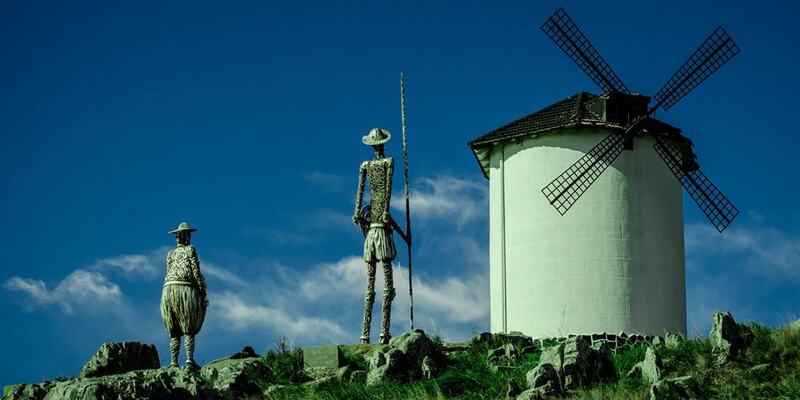 Yes, that guy who mistook windmills for giants and ended up attacking them. Anyway, the Instituto Cervantes is named after the author of this Spanish classic. That makes sense if you think about the fact that its main responsibility is to promote the Spanish language and culture around the world. It’s organizing Spanish courses, cultural activities and educates teachers on their newest methods and curricula. Along with that, the Instituto Cervantes grants the DELE certificate on behalf of the Spanish Ministry for Education and Science. It creates and evaluates the exam in cooperation with the University of Salamanca. It is highly regarded by employers and universities. It is a prerequisite for some university studies. It is valid for a lifetime. The DELE is a highly regarded official title and will facilitate your access to the professional and academic world. It looks good on your CV if you want to work in a Spanish speaking country, and it’s an asset that can boost your income. In fact, for some organizations and universities, it is even compulsory to have this certificate in order to enter or enroll. prove your Spanish skills for the rest of your life. Maybe you’ve already been studying Spanish for a while and want to have an official document proving your skills? Or are you planning a gap year in a Hispanic country and want to make the best of it? Whatever it is for you. It’s time to register for the DELE exam! Get ready for the exam. Join our DELE preparation course! The preparation for the exam itself is already challenging. That’s why we want to ease your burden a bit and collected answers to all the administrative questions. Since November 2015 there are actually no restrictions when it comes to nationality or age. You heard right, that means that even Spanish natives can take the exam. In general, it’s cut out for test takers who are 16 years or older. In case you’re underage, your parents will have to handle the registration or you. 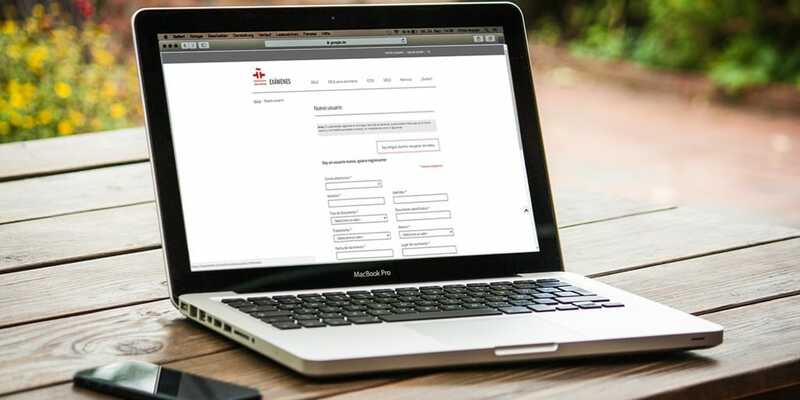 To register for an exam with us, each participant needs to create an account at the Instituto Cervantes website first. That’s the easiest way to check availability for specific exam dates and to sign up right away. You’ll note quickly that the Instituto Cervantes is taking its mission to teach you Spanish seriously. Their whole site and the registration process is currently only available in Spanish. It goes without saying that this may be quite confusing for a beginner who wants to pass the A2 DELE Diploma. So we took the liberty to break the steps down for you. Head to the registration page of the Instituto Cervantes and follow the instructions below. Make sure to enrol within the period of registration and to write down your account details. You’ll need them to get your results afterwards! Create a New Account: The obligatory fields are your email address, name and surname, type of ID and its number, title, gender, birthdate, birthplace, birth country, nationality and your native language. Confirmation Mail: If everything works, you’ll receive a confirmation email. Confirm Email Address: Open the email in your inbox and click on the first link. Start your Session: Click on “Iniciar sesión”. Be aware that this works only one time. Create your Password: Create a good password and save it. 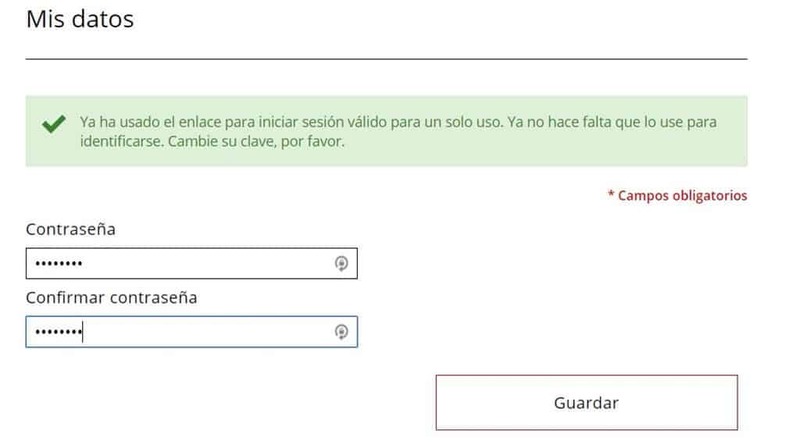 Sign Up for a New Test: Go to “Mis inscripciones” and click on “Nueva inscripción”. Select Exam Location, Date and Level: To take your test at FU International Academy, select “España” as the country and “Tenerife” as the city. Check Availability and Register: Take a look which exams are available and choose the right one by clicking on “Inscribirse”. You can also check out the dates and locations before signing up online. Besides Spain, you can participate in the exam in over 100 countries. Take a look at the more than 1000 examination centers and their available dates. Here at FU International Academy in Puerto de la Cruz in Tenerife, you can register for the DELE exam levels A1, A2, B1, B2, C1 and C2 for the following dates within their enrollment periods. Prices for the DELE exams can vary depending on the country and examination center. But now probably the most important question of all: Which level should you take the DELE exam in? The DELE exam can be taken in different levels, from A1 to C2. If you don’t know your level, you can use the resources of the Common European Framework of Reference for Languages (CEFR) or the level test of the Instituto Cervantes to self-assess your level. The different levels of the DELE diploma are based on the Common European Framework of Reference for Languages (CEFR). It standardizes plurilingual education all around Europe. The most basic level is A1 and leads all the way up to C2 which is close to native proficiency. Let us guess: You still find it hard to pinpoint the exact level you currently are at? First, take a look at the CEFR self-assessment grid. It puts all level descriptions side by side. Check out the entire sheet to get a quick overview. Another solution is to quiz yourself and take the Spanish level test by the Instituto Cervantes. Okay, let’s assume, you were able to decide which level you want to take the test in. So far so good. But admittedly, the CEFR descriptions are a bit wishy-washy, so we have a problem here. How are you supposed to know what exactly to study if you want to ace a certain level? To give you more specific info, we also have something up our sleeves. Just take a look at this overview of all the items and topics officially on your “to-learn list”. It’s the curriculum issued by the Instituto Cervantes. Categorized by Spanish levels, it breaks e.g. the grammar down to small topics. Yes, it looks intimidating. Still, it might help you to gauge the status quo of your Spanish skills and which lessons you have to refresh. Next up: the preparation. How can you get yourself ready for the exam? Preparation for the DELE exam includes first and foremost deciding on which level you want to take the test in (from A1 to C2). It is also advised to study the sample exams and past examinations for each of the levels, published by the Instituto Cervantes. Preparation can take the form of self-study or participation in specialized DELE preparation courses. DELE A1 - How can you make the first breakthrough? use common day-to-day expressions to communicate basic things. ask somebody basic personal questions. interact in a basic fashion with natives, given that they talk slowly and clearly. As in every level, you first have to prove these skills in four different categories. If you can confirm that the following statements apply to you, you’re ready for the DELE A1 exam. “I use easy expressions and sentences to describe where I live and the people who I know. I can join easy conversations if the other person is ready to repeat and helps me out. 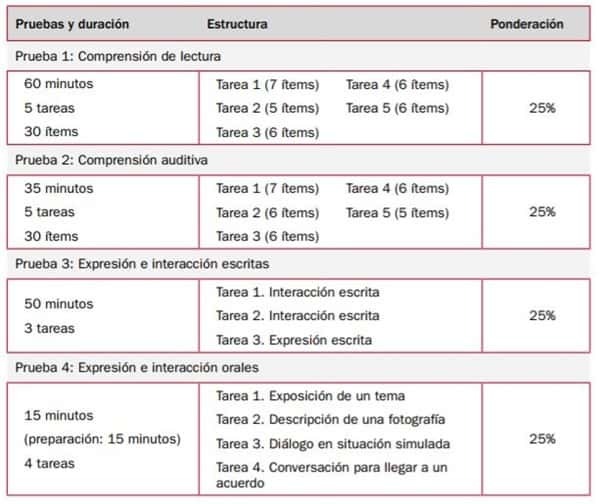 The total exam takes around 2 hours and breaks down to the following tasks. DELE A2 - Did you make your way to the next stage? understand and use daily expressions around information relevant to your surroundings. This can be personal information, going shopping or interesting locations. address questions with reference to your immediate needs. The learning goals of the four different categories of the DELE A2 exam are the following. 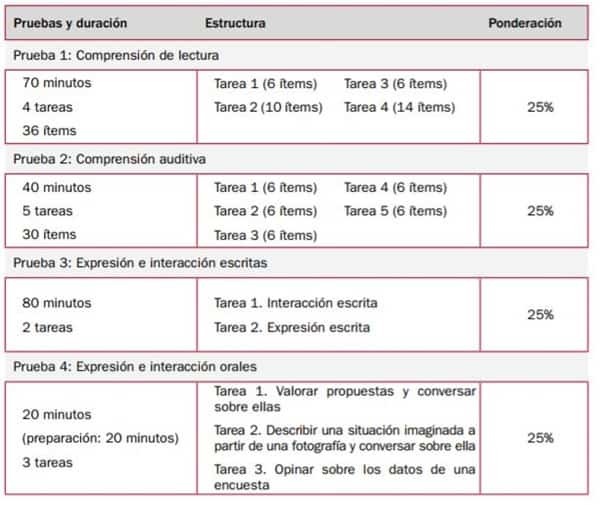 Adding 60 minutes, the exam lasts around 3 hours and is structured like this. DELE B1 - Have you passed the first threshold? understand the main topics when listening or reading texts. They will be about familiar topics like studies, work or daily life and may have some slight variations in the language. write simple but coherent texts on familiar topics like experiences, plans, wishes or opinions. For the B1 exam, you need to calculate around 3.5 hours. Take a look at the structure. DELE B2 - Have you already gained a vantage? You’re more than halfway to being a Spanish native. Way to go! understand complex written and spoken texts even when they are abstract or technical. You can also grasp different variations of the Spanish language. interact with all types of Spanish speakers in a fluent and natural way without hesitation. write clear and detailed texts on several topics and debate to defend your opinion. According to the CEFR framework, you should go for this test if you can confirm the following statements about yourself. It’s getting longer and longer. To complete the B2 exam, you have to prepare for around 4 hours of test time. DELE C1 - Are you at an effective operational proficiency yet? Now it’s getting professional. You’re closing the gap on the Spanish natives of the world. process a wide variety of written and spoken text in every variation of the Spanish language. This also includes implicit meanings, attitudes, and intentions. express yourself fluently, spontaneously and without any apparent effort. write complex texts with a flexible and efficient use of Spanish and a coherent structure. Do the following statements still sound reasonable and fitting to you? Way to go! “I understand long speeches even if they are not clear and only implicitly hint the main relations. “I’m able to write clear and detailed about a wide series of topics. This can be informative reports or those conveying a certain point of view. DELE C2 - Have you reached mastery? handle any situation and understand everything, written or spoken. It doesn’t matter how complex, abstract, unfamiliar or expressed in different variations of Spanish it is. express yourself spontaneously, fluently and with an exceptional semantical and grammatical precision. You do so in every context, be it academic or professional. Can you proudly confirm these statements for yourself? Then go for the final challenge! “I’m capable of joining any discussion effortlessly and use colloquial phrases. If I encounter a problem, I solve it with such discretion that none of my counterparts will notice. “I’m able to write clear and fluent texts as well as complex letters or reports. I apply a good structure so my readers won’t get lost and grasp the main ideas. Sample papers and past exam papers are a great way how to get a better idea of what is expected from you for each of the different levels in the DELE exam. We looked into the official guidelines by the Instituto Cervantes. They publish one sample exam paper (+ answer sheet) per level as well as one past exam from previous years. It’s a great way to familiarize yourself with the nature of the tasks. Make sure to work through the version corresponding to your level! From our experience, we can tell that studying on your own is a hard thing. Especially, when you are always connected to the world wide web and procrastination is looming just a click away. But there are plenty of ways to turn the tables! For example, why don’t you join the DELE Facebook group? This way you at least make sure that your news feed includes tips and tricks on how to pass the DELE exam. Or you could go digital to support your vocabulary learning with Duolingo and Tiny Cards. Here you can create your own vocabulary lists or learn those from other users. Use this together with Spanish movies and Spanish music to learn the language and you’ll see that you can also use the world wide web to your advantage. 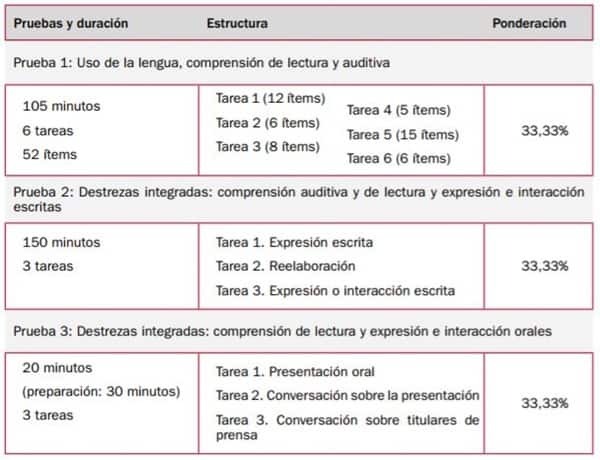 If you prefer the old-school way, use the official resources published by the Instituto Cervantes: DELE preparation books. Indeed, it’s possible to prepare for the DELE exam by yourself if you put in enough time and effort. But. Don’t you want to fast track your studies? Then we have an alternative solution for you. Before starting the course, you’ll take part in a placement test. Our teachers will personally assess your Spanish proficiency level, so you can rest assured that you’re preparing for the right exam. We use teaching material developed especially for the preparation of DELE exams. All these additional resources address specific issues in the same context. They’re also geared towards creating a wide range of real life situations to practice the language. All of our teachers are Spanish native speakers and specialize in teaching Spanish as a Foreign Language. Some of them possess additional qualifications from the Instituto Cervantes to conduct the DELE exam as an examiner. 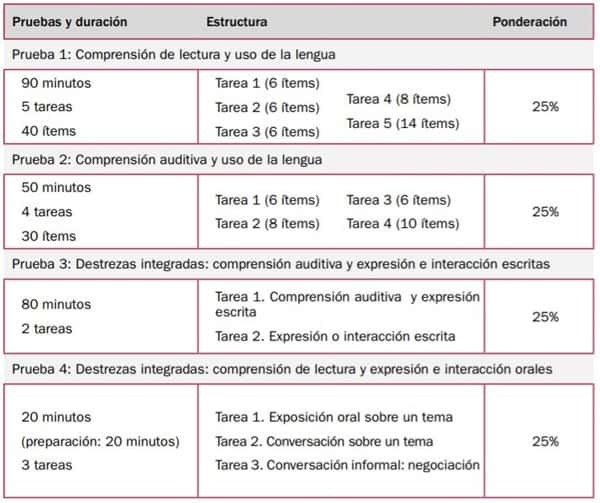 Before you sign up for the course, it’s necessary to complete our online Spanish Level Test. It will be corrected by experienced teachers who will identify your current level. With our full immersion teaching methods, we teach you everything you need to know for the exam. You will follow a general Spanish Intensive 20 course in the morning and have extra exam preparation lessons in the afternoon. This way, we’ll guide you through the exam format and show you the right way to use your knowledge and skills effectively. After you’ve finished our DELE preparation course, there won’t be any surprises in the exam! Improve your knowledge of vocabulary according to the exam level descriptions. Train all four exam areas (reading – listening – writing – talking) and their testing methods. We will advise you on the exam that best suits your level, based on a pre-course test. We can prepare you for any of the six different levels of the DELE exams (A1, A2, B1, B2, C1, C2). We will help you with the registration process if needed. DELE Exam Day and Results – What Can You Expect? If you made it until here, chances are that this probably will become reality for you soon enough. To calm your nerves it always helps to know what exactly is waiting for you. We already described how each exam is structured for the different CEFR levels. But now we want to give you some first-hand, personal insights. Daphne, our academic director and Senior DELE examiner wrote down how the procedure of the DELE exam works at FU International Academy. Click on the plus below to find out. 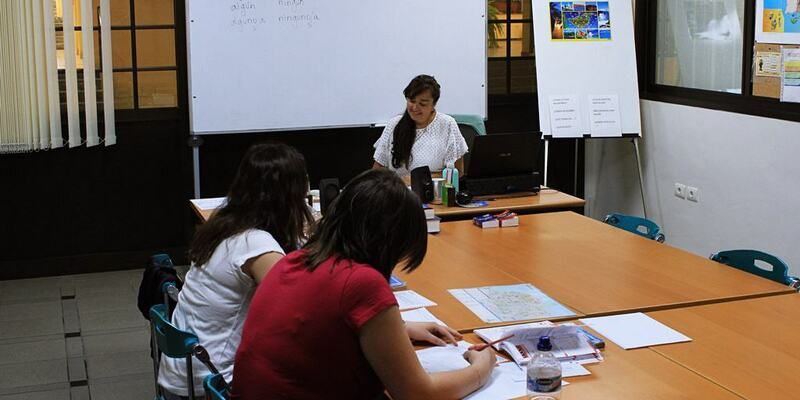 Almost every month, thousands of students around the globe face the DELE exam (the official Spanish proficiency exam). We -the examiners- watch them arrive to our centres filled with nervous expectation and hope. The examiners arrive at 8:00 am on the exam day, 60 minutes before the scheduled starting time, and yet, some of the candidates have beaten us to it and are already waiting at the door. They will look at us pleadingly, as we tell them they must wait. We make sure that all the necessary materials (instructions, pencils, erasers and exam papers) are placed in the classrooms, ready for the participants. We then proceed to test the audio equipment to ensure that it will work perfectly during the listening test. Thirty minutes before the starting time (09:00 a.m.) we welcome our examinees and begin to call them one by one, verifying their documentation. This is a long and arduous process that must be carried out conscientiously. Candidates come from various countries. Their names reveal their origins: the Arab-speaking world, Pakistan, India, Eastern Europe. 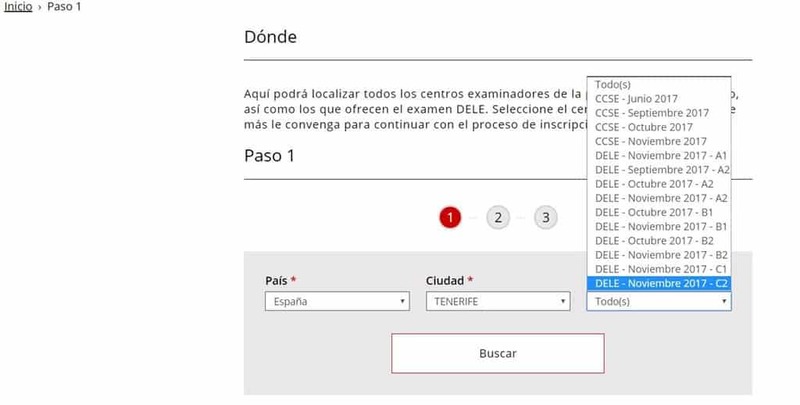 Most probably, some candidates have decided to sit the DELE exam to apply for Spanish nationality, therefore, the exam becomes a very crucial event in their lives. We empathize with them but must follow the rules set by the Spanish Ministry of Justice, making sure everyone has their documents in order. Ten minutes before 9:00 am, we close the classroom door and start giving instructions. We make sure we explain how to proceed, step by step, from switching off their mobile phones to how to complete the answer sheets, using only the special pencils we’ve provided. We make sure we transmit reassurance and professionalism. At 9 o’clock we start with the reading test. This exam requires great intellectual effort, regardless of the exam level. After 45 minutes, we let them know they have fifteen minutes left to finish. Five minutes before the hour, we announce that they must finish. Sometimes participants haven’t managed to finish this first part of the exams and refuse to return the paper, trying to complete the answers. This is one of the situations that examiners fear the most. On the one hand, you feel for them, but we know we must follow the schedule and continue. So, we take the exams away, much against our feelings of empathy. Almost immediately, we start with the listening test. Fifty minutes later, we allow them twenty-five minutes to rest and recover their energy with a hot coffee at FU Café. In the meantime, the examiners prepare the room for the written test. We swap pencils for pens and provide the candidates with blank sheets of paper for the draft writing. Our experience and the careful preparation done beforehand, will allow the examiners ten minutes for a coffee break as well. Back in the exam room, we explain the procedure to do the written test. Candidates can leave quietly once they’ve finished. They don’t need to wait for everyone to finish. Once everyone’s left the room, we start preparing for the oral tests. For some, this is the hardest of all, whilst for others, it will be a breeze. Before starting the test, we ask the candidate various information questions as a kind of introduction. They’re not graded on this, it just makes the situation more comfortable and helps to ease the moment. We determine whether to use “usted” or “tú” with the examinee. During this part of the exam, we want to assess if the candidate can answer the questions with appropriate and wide-ranging vocabulary, and if he or she understands what we’re saying. Most candidates take pleasure in telling us about their personal circumstances: why they live in Spain, where they live, and even what their lives were like in their countries of origin. Many now live in Tenerife –they tell us where they live and how they’ve had a very early start in the morning, to make it on time. Whatever their personal situation, our job is to test the range, accuracy, fluency, interaction and coherence of their speaking skills, following the European Framework of Reference descriptors and the Instituto Cervantes Curriculum Plan (PCIC). When it comes to assessing oral communication, we know that we must steel ourselves to be objective. This is a huge responsibility. One of the functions of the oral exam interviewer, is to help the candidates achieve their best possible performance. A bad interviewer can cause the candidate to do worse than they might have done otherwise. On the days following a DELE exam, we feel particularly lucky to do what we do. Changing back into the groove of our everyday work makes us think about the things our job adds to our lives: teaching languages, and particularly being a language examiner, gives you insights into the lives and experiences of all kinds of people. This enriches us all, both personally and professionally. DELE Results – When Do You Receive Them? It takes around 3 months until the results are available on the online platform – sometimes less. Besides the oral assessment, each examination center sends all answer sheets to the Instituto Cervantes where they are corrected. That’s also why we, unfortunately, won’t be able to give you updates about the status of your results, even if you took the test with us. Once the results are ready, the Instituto Cervantes will send you a mail to the address that you used to register. So please make sure to keep your account details safe. Get this. In 2016 DELE totaled over 75,000 test takers from all around the world! And that’s actually a good thing. The popularity of the DELE exam speaks volumes about how valuable it is. Spanish speaking world right at your feet. 346 queries in 3.619 seconds.